The US trade dispute with Mexico is heating up. 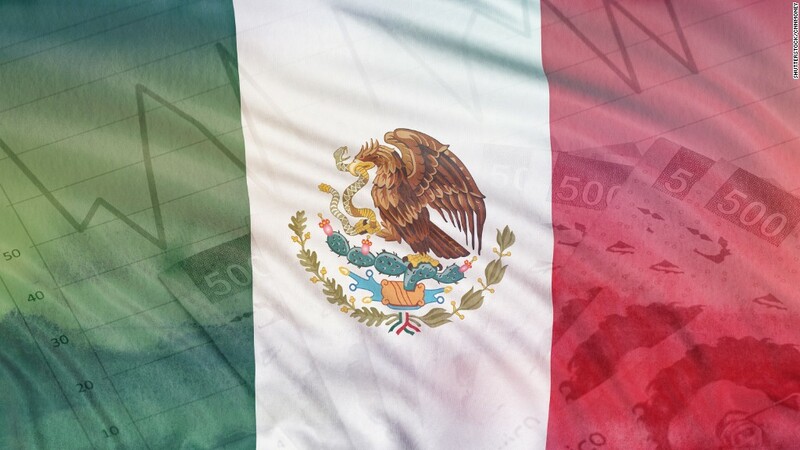 In retaliation for the Trump administration announcing tariffs on steel and aluminum imports from Mexico and much of the rest of the world, Mexico Tuesday imposed a series of tariffs against US exports to its market valued at $3 billion. They'll hike the price of products including pork, apples, potatoes, bourbon as well as different types of cheese. The tariffs range between 15% and 25%, and could raise the price of US goods by that amount, cutting deeply into US exports to its neighbor. "It is necessary and urgent to impose measures equivalent to the measures implemented by" the US, said the statement issued by the Mexican government. Mexico had signaled last week that it intended to retaliate against the US steel and aluminum tariffs. In addition to the agricultural products and bourbon, Mexico imposed tariffs on a variety of US steel products exports. While Mexico exports more goods and services to the US than it buys, it is also the second largest market for US exports, buying $277 billion worth of US goods and services last year, according to the Commerce Department. That put it behind only Canada in terms of the value of US exports. The tariffs imposed Tuesday will affect just more than 1% of US exports to Mexico. But they'll have a significant impact on the targeted US industries. For example Mexico is the largest market for US pork exports according to the National Pork Producers Council, an industry trade group. It says that 25% of US pork exports last year went to Mexico. "A 20% tariff eliminates our ability to compete effectively in Mexico," said Jim Heimerl, the trade group's president and a pork producer from Johnstown, Ohio. "This is devastating to my family and pork producing families across the United States." The group says that there are 110,000 US jobs directly tied to US pork exports to Mexico as well as to other countries. NAFTA, the three nation trade pact, generally prevents the US, Mexico and Canada from imposing tariffs on imports from one another. But President Donald Trump has been a fierce critic of NAFTA, and the three countries are holding negotiations on possible changes to the free trade deal. The Trump administration said it needs to impose tariffs on steel and aluminum imports because overcapacity in those industries globally is hurting US steel mills and aluminum smelters by driving down the prices of their products, forcing many out of business. The US Commerce Department says that constitutes a threat to US national security. Canada has also announced plans to retaliate with tariffs of up to 25% on nearly $13 billion of US products, set to take effect on July 1. Those products include US steel and aluminum as well as food an other agricultural products. But Canada, which is a country that buys more US goods and services than it exports here, also will put tariffs on a wide variety of consumer products, ranging from ballpoint pens and dishwasher detergent to toilet paper and playing cards. And it will put tariffs on some larger ticket items such as sailboats, washing machines, dish washers and lawn mowers. The EU also has announced a series of retaliatory tariffs of 25% on roughly 200 American products, including orange juice, that are set to take effect in July. US denim, bourbon, motorcycles, peanut butter, motor boats and cigarettes will cost more in Europe as a result. The US Chamber of Commerce says that 2.6 million jobs are threatened by the Trump administration's hardline stance on imports, citing the possibility of retaliatory tariffs by US trading partners. According to a survey of US CEOs, many are scaling back their hiring and spending plans due to fears of a trade war. Correction: A previous version of this story incorrectly stated the value of all US exports to Mexico. -- CNN's Spencer Feingold, Matthew J. Friedman and Alanna Petroff contributed to this report.